The Cad Interfaces within StruM.I.S give the user the ability to import material lists either from a CAD generated report, a comma separated CSV file or a tab separated txt file. These Material Lists are generated using a third party application such as Tekla and ProSteel, etc and make the transfer of information from these programs seamless. There are however occasions when the information within these files cause there to be invalid marks. This isn’t a difficult thing to overcome but can appear daunting to a customer the first time they encounter this so the purpose of this document is to equip you with the knowledge to cope when you find invalid marks. During the Import, items are put into 1 of 4 tabs; Valid Mark Items, Unrecognised Mark Items, Invalid Marks and Invalid Dimensions. This is shown above. It is done in this way so as to make life as easy as possible for the user in determining how to resolve Invalid Marks. In an ideal world you would have all items in the Valid Mark Items tab. However, there are a variety of reasons why this may not be the case and it is the users’ task to either put this right during the import or go back to whoever issued the model and request that the data is re-issued correctly. Below is a list of reasons why we may have Invalid Marks that is displayed if the user hovers the mouse over the invalid Marks tab. This document has been created with the more common reasons there may be Invalid Marks at the top and the less common reasons at the bottom. Starting at the top and working through this should resolve any invalid Marks but if you’re still experiencing Invalid Marks then contact StruM.I.S Support. In the above example I have 644 Valid Mark Items but 12 Invalid Marks. This has been caused by there being 12 Unrecognised Mark Items. This example is the most common reason we may have invalid Marks. 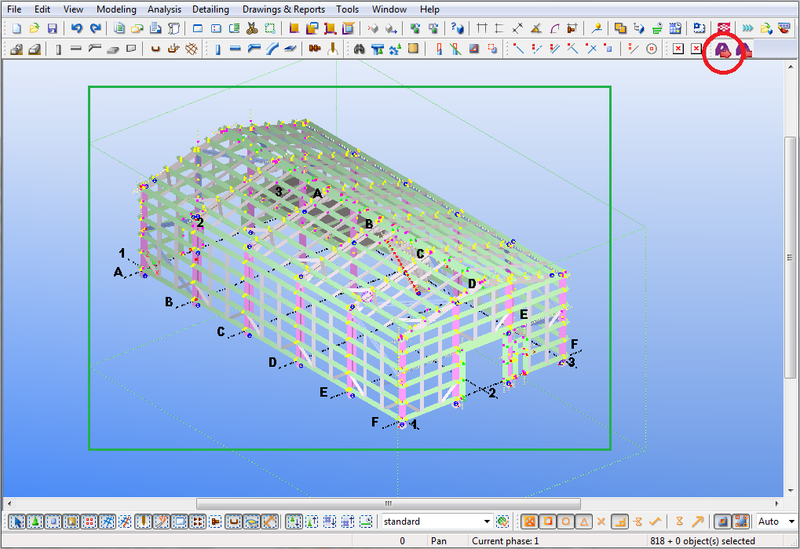 It is caused in this instance by the section UB406X178X54 being specified differently in the CAD package (using an * instead of an X to separate dimensions) to what it is in StruM.I.S. This is easily and quickly resolved. In the above example I have only 60 Valid Mark Items but 231 Invalid Marks. This has been caused by there being 377 Unrecognised Mark Items. This has been caused by the Steel Grade S275JR being specified as S_275JR in the CAD package. We could simply repeat the same instructions as above for Unrecognised Items, but it in this case it is quicker to add a Cross Reference to the Grade library. In the above example I have 584 Valid Mark Items but 35 Invalid Marks. This has been caused by there being 31 Invalid Dimensions. This will have been caused by there being a tolerance in the CAD package that has been set to allow components that vary up to and including 5mm to be marked the same. Note: StruM.I.S has an option “CAD Interface Dimensions tolerance” that can be found under Contracts Management Options and also the option to round up or down. I’ve purposely left this set to 3mm for the purpose of this exercise but had this been set to 5mm Up, it would have made all Mark Item 1 9070mm and PLT1 705mm for me. In the above example I have 584 Valid Mark Items but 84 Invalid Marks. This kind of Invalid Mark is a little more difficult to work out than the above examples as the incriminating Mark Items aren’t put onto a separate tab like the Unrecognised and Invalid Dimensions are. However, when you know what to look for and how to find it, it becomes much easier. 5. In this example, there is a Mark Item “PLT1” that has been incorrectly specified as a 120x10FLAT in one instance but in all other cases is specified as a 450x25FLAT. The User in this instance can either edit the source file or liaise with the draughtsman who could either re-mark the 120x10FLAT or change it to match all other PLT1 Mark Items. In any case, the user knows exactly where the issue is and was able to find so quite easily using the group by feature. If the option is turned on within the contract to read Lot/Load and Phase/Zone information from the CAD file, then all Mark Items that make up a Mark must share the same Phase/Zone or Lot/Load information. The example below shows the invalid Mark 5 which has become invalid due to all items being in Lot 3 besides the Mark Item PLT3. This is resolved by using the “Re-Lot” option at the bottom of the screen. 1. 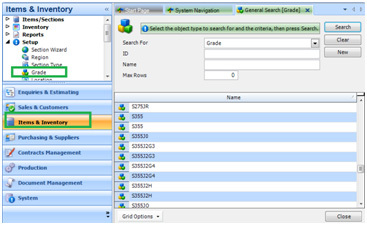 Highlight the row you wish to re-lot (say PLT3 in this example), enter the desired lot as shown below and click OK.
As the option “Selected items only” is selected, this will only update this row. If there are invalid marks and the screen looks like below, then the wisest course of action is to liaise with the Draughtsman and have them issue a new report. This example has Mark Item 1 having no quantity. Alternatively, you could edit the CAD file if you are certain you know the correct quantity but it’s always best to have an up to date model. As previously mentioned, if there are multiple instances of a Mark Item, then all its physical properties must be the same. This is true of its cut type. 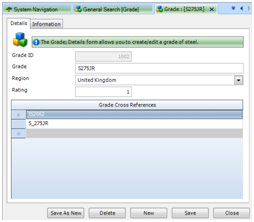 Note: To find this easier, the user may wish to use the “Group By” method that was used during the explanation on “More than one Mark Item share the same name but have different properties”, only this time grouping first by “Mark Item” and then “Cut Type” looking for a Mark Item that has (2 items) listed next to it. 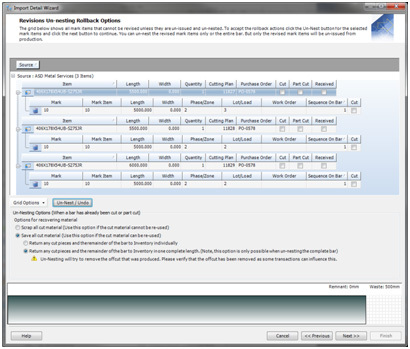 b) Turn off the option for Cut Type within the Cad Interface so that it imports all items as Straight Cut. The second option is quickest, but will mean all items are imported as Straight Cut for all Marks. If there are still Invalid Marks at this point then it is likely a Mark does not have a main member specified. This occurs when Mark Items are created off of a Dummy member withing the CAD package and the Dummy member is set to be the Main member in error by the Draughtsman. 3. The SourceMainMember column displays a 0 for those not listed a main member, and a 1 for those that are. If there is no main member specified at all then this Mark becomes Invalid. The above example shows Mark 1 as having no main member. The only solution in this instance is to go back to the draughtsman and have them correct the issue in the CAD Package and reissue the list. 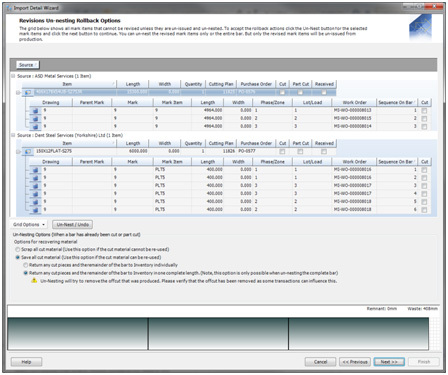 The Generate Contract Work Orders task within StruMIS gives the user the ability to easily select the best fabrication route for the selected Mark or Mark Item by utilizing the rules within Workstations and Templates created previously (See Chapter 7 of the StruMIS evolution training manual). This is for the most part an automated process and will save the user a lot of time and effort. However, there are occasions when the work orders may need to be adjusted and this might not be prior to the fabrication commencing. In these situations, the user would not want to un-issue the job from the workshop but would rather amend the planned work-flow. It is the purpose of this document to highlight some of the changes that may need making on occasion and the different methods with which the user can implement these changes. One of the most useful features of the Generate Contract Work Orders task is that it can utilise the NC data of a Mark Item to determine which processes are required. Below is an example of a Circular Hollow Section used as a beam with a Fin Plate style connection. Note how the Plate PLT15 has holes but PLT14 does not. Because of this, StruMIS would route both plates to the same cutting station but once cutting has been undertaken, PLT15 will move onto the Drill and PLT14 will move onto Complete. This means that the user does not have to progress items through processes that the Mark Items do not actually need to go through. However, occasionally the operator will know that they will need to override the suggested path that the items have been routed down. E.g. If the above assembly needs to be galvanized then it will require drainage holes in the cap plates (PLT14). Ideally the draughtsman will have detailed the plate with the galvanisation in mind but this is not always the case and so instead it is up to a user in the production office do this. 1) Locate the Item in the Production Control grid. Below shows all the items that are currently at the process Cutting and specifically at the Workstation Guillotine. Note: The Next Process column shows as being Complete for the Mark Item PLT14 as previously mentioned and that PLT15 is due to move onto Holemaking. 2) Either double-click on the line or click on Actions then select View Work Order whilst the line is highlighted. Either way, this will open the Work Order and allow the user to modify it. 3) Click onto the Processes tab, this will show all the existing processes for this Mark Item which in this example would only be Cutting. 4) To add a new process click into the drop down menu beneath the existing Processes as shown below. 5) Once the Process is added, the user can also amend the Workstation at which this process is to be undertaken and also the Planned times. Note: It is within the Processes tab that the user could also make adjustments to an existing Process. E.g. Change the Workstation at which Cutting is to be done or remove a Process that is no longer required. 6) When you are happy with the changes, click on Save and then Close. When the user returns to the Production Control grid and clicks on Refresh, they will notice that the Next Process is now Holemaking. This is shown below. The above example of opening a Work Order and making changes to it is great if the user is updating only a few lines. However, there may be occasions where the user has to update a large number of lines and making the same change to each of them. In these situations it would be frustrating to the user to have to open each line one at time and make the same change over and over so instead it’s better to use the Batch Update option. 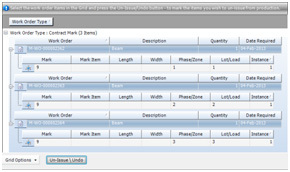 • Add Work Order Processes – Allows the user to add a brand new process to a selection of Work Orders. • Update Work Order Processes – Allows the user to make a change to an existing Process that appears within their work orders. Examples of this could be changing the workstation at which cutting is performed at or increasing / decreasing the planned time it takes to undertake this process. • Remove Work Order Processes – Deletes a Process that is no longer required from the Work Order. Examples of each are shown below. Below is a list of fittings required for Contract C-0155. Note: PLT14 and PLT15 will be cut at the Guillotine then move onto Holemaking but PLT8 will be Complete upon being cut. 1) Highlight all items currently at the Guillotine. 2) Click on the Batch Update button and choose the option Add Work Order Process. 3) The Add Processes form will be displayed. 4) Adding an inspection process that will take 5 minutes after the process of Cutting. 5) Click OK to commit the changes. Note: If this process change became permanent in your production flow then it would be a good idea to amend the Production Template. Below are the beams for one of the Lots required for Contract C-0155. 1) Highlight the lines that need to be changed. (In this example we will highlight all items currently at the Kaltenbach Saw). 2) Click on the Batch Update button and choose the option Update Work Order Process. 3) This will open the following window. Make the adjustments as required. 4) Click OK to commit changes. Now when the user checks the Production Control grid, they will notice that Mark Items 26 & 27 are no longer at the Kaltenbach Saw and have been moved to the Flame Cutting Workstation. Below are some of the Marks for one of the Lots required for Contract C-0155. You can see down the left hand side the production flow that these assemblies could take to become completed i.e. erected on site. For the purpose of this exercise we will remove Shop Paint from the Work Order as a process that these items must go through. 1) Highlight the lines that are to be changed (In this example we will highlight all items currently at the process Assembly / Welding). 2) Click on the Batch Update button and choose the option Remove Work Order Process. 3) This will open the following window. Select Shop Paint from the For All Production Processes drop-down menu. In an ideal world, once a job is detailed and issued, that would be it. However, this is not a perfect world and it’s possible that the job can be revised at any time. This might be early enough that Steel has not been procured yet or might be late enough that the revised parts are fabricated and ready for dispatch. The purpose of this document is to highlight some of the different scenarios a revised material list might cause and to explain how the user is to deal with these changes. Note: details on how to use the Cad Interfaces can be found in the StruMIS evolution training manual within chapter 5; Contracts Management. When the items within the import file have been verified and the user is ready to finish the import they’ll be presented with the revisions form. • Unchanged Mark Items – These are the items that have not altered between the revised imported file and the original Detail Listing. • New Mark Items – These are all the items that are in the revised imported file that were not in the original Detail Listing. • Changed Mark Items – These are items that are in the original Detailed Listing but one or more properties are different from the revised imported file. • Removed Mark Items – These are items that existed in the original Detailed Listing but no longer exist in the revised imported file. • Invalid Mark Items – These are Mark Items that are part of a Mark or Assembly Mark that is invalid because the Mark or Mark Item is new but has a component Mark Item with a revision change that cannot be revised. Note: You can run a Revision Report from the Actions button on this screen Only. 1. 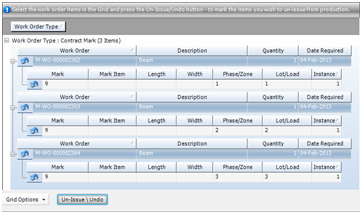 Make sure you have the Mark Item Status and Can Revise columns visible in the grid. These will assist you when making decisions about the revisions. 2. When you are happy with the results of the revised imported list, click Next. • Ignore all new items – Ignore all new items in the revised import file. • Hold marks where the mark items cannot be created – This will put existing Marks on hold if new Mark Items on the Mark cannot be created. Note: With this option unchecked only the affected Mark Item will be placed on hold. • Revise changed items – This will create revisions for the items that can be revised but will place un-revisable items on hold. o Hold all mark items on a revised mark – This will put all Mark Items of a Mark on hold when a Mark is placed on hold. • Leave changed items and come back later – This will not revise changed items. • Ignore all changed items – This will ignore all changes. 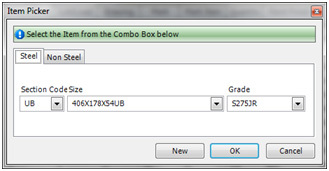 • Import all new marks – This will add the new Marks but place any existing Mark Items that cannot be revised on hold. • Ignore all new marks – This will ignore any new Marks that have Mark Items that cannot be revised. • Ignore all removed Items – This will ignore items that are marked for removal. • Place removed items on hold – This will place items marked for removal on hold. o Hold all mark items on a removed mark – This will put all Mark Items of a Mark on hold when a Mark is marked for removal. 4. Click the Finish button, all valid Items will be imported and the Contract Detailed Listing form will then appear. If all instances of a Mark’s Phase and Lot have been changed then StruM.I.S will make these changes automatically when the Import Detailing List Wizard is complete. The following examples are based on the Revision Setting for Non-Material Changes set to Allow All Revisions. • Mark 9 – Qty = 3 off, all in Phase 1 Lot 1. 2. Mark 9 has been released, nested and both Mark Item and Mark work orders have been generated. 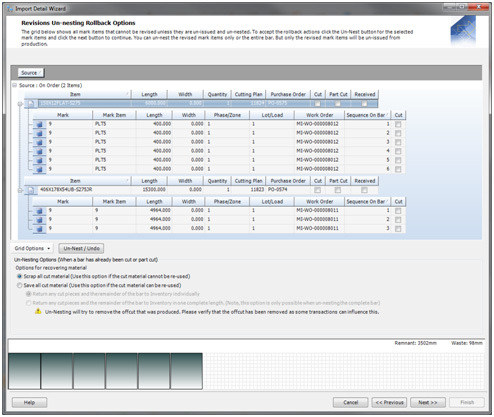 • See the snapshot of the Production Lotting form with the Phase and Lot columns highlighted. • Mark 9 – Qty = 3 off, all moved to Phase 2 Lot 2. 4. From the Item Listing screen of the Wizard, click the Next button and the Revision screen will be displayed. Note: All instances of Mark 9 have been changed; therefore this is a Phase/Zone Change and a Lot/Load Change. The Can Revise checkbox is ticked which means that the revision will take place automatically. 5. Click the Next button and the Create Detail List screen will now be displayed. 6. Click the Finish button, the revision will now take place automatically and the Mark Items will be updated to Phase 2 and Lot 2. • Mark 9 – Qty = 3 off, all moved to Phase 2 Lot 1. Note: All instances of Mark 9 have been changed; therefore this is a Phase/Zone Change (StruM.I.S would also recognise it as a Lot/Load Change) and the revision will take place automatically. 6. Click the Finish button, the revision will now take place automatically and the Mark Items will be updated to Phase 2 and Lot 1. • Mark 9 – Qty = 3 off, all moved to Phase 1 Lot 2. Note: All instances of Mark 9 have been changed, therefore this is a Lot/Load Change and the revision will take place automatically. 6. Click the Finish button, the revision will now take place automatically and the Mark Items will be updated to Phase 1 and Lot 2. • Mark 9 – Qty = two off in Phase 1 Lot 1 and 1 off moved to Phase 1 Lot 2. Note: All instances of Mark 9 have not been changed, therefore this is both a Mark Lot/Load Quantity Decrease and a Mark Lot/Load Quantity Increase and the Can Revise checkbox is un-ticked. This means that the Changed Mark Items will not be updated automatically. 5. 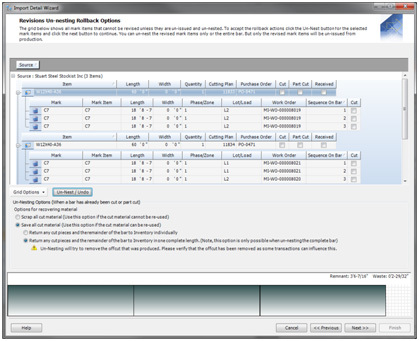 Therefore, click the Next button and the Revisions Un-nesting Rollback Options form will be displayed. 6. For the revision to take place Un-nest all instances of Mark 9 (this automatically un-issues the Mark Item Work Orders). 7. Click the Next button and the Revisions Un-Issue Rollback Options form will now be displayed. 8. Select the Work Order then click the Un-Issue Undo button. Note: The icons for the Mark Work Order will change to confirm that they will be rolled back. 9. Click the Next button and the Create Detail List screen will now be displayed. 10. Click the Finish button, the revision will now take place automatically and Mark 9 will be rolled back to Lotted (not released). It is at this point that you should consider what happens to the Purchase Order and the associated material when a revision occurs and Mark Items are Un-nested. The following scenarios are based on the Status of the Purchase Order when the revision takes place. • The original nested material is removed from the Lines Tab. • The Purchase Order number may be used for the new nested Mark Items. • The original material remains on the Lines Tab, however, the material is only allocated to the Contract and the Mark Item allocation is removed. 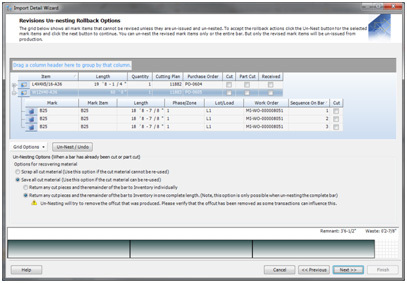 • The material on the Purchase Order may be used for the new nested Mark Items. • The original material is only allocated to the Contract and the Mark Item allocation is removed. • The material in Inventory may be used for the new nested Mark Items. • Mark 9 – Qty = 3 off, one in Phase 1 Lot 1, one in Phase 2 Lot 2 and one in Phase 3 Lot 3. • Mark 9 – Qty = 3 off, one in Phase 1 Lot 1, one in Phase 2 Lot 2 and one moved to Phase 4 Lot 4. Note: As all instances of Mark 9 have not been changed, therefore this is a Mark Phase/Zone Quantity Decrease, a Mark Lot/Load Quantity Decrease, a Mark Phase/Zone Quantity Increase and a Mark Lot/Load Quantity Increase and the Can Revise checkbox is un-ticked. This means that the Changed Mark Items will not be updated automatically. 5. Click the Next button and the Revisions Un-nesting Rollback Options form will be displayed. 8. Select the Work Order(s) then click the Un-Issue Undo button. 10. Click the Finish button, the revision will now take place and Mark 9 will be rolled back to Lotted (not released). If the length of a Mark Item has been changed then StruM.I.S will interrogate the cutting plans to determine whether the nested bar is long enough to accept the revised lengths. If this is the case then the cutting plans are updated automatically when the Import Detailing List Wizard is complete. The following examples are based on the Revision Setting for Material Changes set to Allow If Released and with the Always apply production length revision changes checkbox ticked. • Mark Item 10 – 3 off, 5000mm long. Nested to 2 bars 5500mm & 1 bar 6000mm. 2. Mark Item 10 has been released and nested but the Mark Item(s) has not been issued to production. • Mark Item 10 – 3 off, now increased to 5600mm long. Note: As all of the original nested bars are not long enough to accept the revised length then none of the cutting plans will be updated automatically. 6. For the revision to take place Un-nest all instances of Mark Item 10. 7. Click the Next button and the Create Detail List screen will now be displayed. 8. Click the Finish button, the revision will now take place and Mark Item 10 will be rolled back to Not Covered in the Production Nesting Ordering form. • Mark Item 10 – 3 off, 5000mm long. Nested to 3 bars 6000mm. • snapshot of the Detailed Nesting Cutting List Report with the Cuts To Make column and Cutting Plan numbers highlighted. Note: As all of the original nested bars are long enough to accept the revised length then the revision will take place and the cutting plans will be updated automatically. 6. Click the Finish button, the revision will now take place automatically and the Mark Items will be updated to the new lengths. • Below is a snapshot of the Detailed Nesting Cutting List Report with the Cuts To Make column and Cutting Plan numbers highlighted. Note: The Cuts To Make values have been updated automatically while the Cutting Plan numbers have remained the same. The following examples are based on the Revision Setting for Material Changes set to Allow Revisions if Released. • Mark Item C7– Section size W12 x 40 x 18’ 8 – 7/8” Grade A36. 2. Mark Item C7 has been released but has not been nested or issued to production. • Mark Item C7– Section size increased to W12 x 50 x 18’ 8 – 7/8” Grade A992gr50. Note: The Item Listing screen will highlight under the Listed In System As column that the Mark Item was originally imported as a W12 x 40-A36. Note: All instances of Mark Item C7 have been changed, therefore this is a Mark Item Section revision and the Can Revise checkbox is ticked. This means that the Changed Mark Items will be updated automatically. 6. Click the Finish button and the revision will now take place automatically and the Mark Items will be updated to the new Section Size. • Mark Item C7 = W12 x 40 x 18’ 8 – 7/8” Grade A36 with Mark Item CLT1 = 2 x Clip Angles L4”x4”x5/16” x 8-1/2” Grade A36. 2. Mark Item C7and Mark Item CLT1 has been released, nested and issued to production. • Mark Item C7 = W12 x 50 x 18’ 8 – 7/8” Grade A992gr50 with Mark Item CLT1 remain unchanged. Note: As all instances of Mark C7 Beam have not been changed, therefore this is a Mark Item Section revision and the Can Revise checkbox is un-ticked. This means that the Changed Mark Items will not be updated automatically. 6. For the revision to take place Un-nest all instances of Mark Item C7 (this automatically un-issues the Mark Item Work Orders). 8. Click the Finish button, the revision will now take place and Mark Item C7 will be rolled back to Not Covered in the Production Nesting Ordering form. Note: The work orders for Mark Item C7 will also be rolled back to Mark Items Not Issued in the Generate Contract Work Orders form. 9. Mark Item CLT1 will remain unchanged as nested and issued to production. 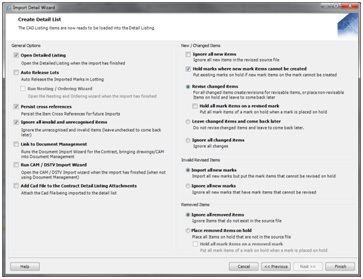 Note: In Example 9, if the Revision Setting for Material Changes was set to Allow All Revisions, then the revision would take place without opening the Revisions Un-nesting Rollback Options form. The Mark Items would be updated to show the revised section size but the material would not be un-nested. The cutting plans would therefore still show Mark Item C7 as nested to the original (different section size) bar. If a Mark Item(s) quantity has been changed or a new Mark Item has been created then StruM.I.S will make these changes automatically when the Import Detailing List Wizard is complete. The following example is based on the Revision Setting for Non-Material Changes set to Allow All Revisions. • Mark C4M – Consisting of C4M Main Member 1 off, PLT1 Base Plate 1 off and PLT3 Rectangular Stiffeners 2 off. 2. Mark C4M has been released, nested and both Mark Item and Mark work orders have been generated. • Mark C4M – Consisting of C4M Main Member 1 off, PLT1 Base Plate 1 off, PLT3 Rectangular Stiffeners increased to 8 off and an additional PLT4 Rectangular Stiffener 1 off. Note: PLT3 has been changed; therefore this is a Mark Item Quantity Increased and PLT4 is a new item; therefore this is a Mark Item Created. The Can Revise checkbox is ticked which means that the revision will take place automatically. 6. Click the Finish button, the revision will now take place automatically and the additional Mark Item PLT3 and the new Mark Item PLT4 will appear on the Production Nesting Ordering form as Not Covered. Note: PLT3 is now displayed on separate lines, this is because the original Mark Items have been issued to Production and assigned to a Workstation. 7. If Mark C4M was released, nested but the Mark Items were not issued to production then the additional Mark Item PLT3 would appear on the Production Nesting Ordering form as Part Covered. 8. Mark Item PLT4 will appear on the Production Nesting Ordering form as Not Covered in both cases. 9. The additional plates PLT3 and the new plate PLT4 will also appear on the Generate Contract Work Orders form as Mark Items Not Issued. The following example is based on the Revision Setting for Non-Material Changes set to Allow All Revisions and for Material Changes set to Allow Revision if Released. • Mark 8 – Consisting of Mark Items 8, PLT1, PLT3 and PLT4. 2. Mark 8 has been released, nested and both Mark Item and Mark work orders have been generated. • Mark 8 – Consisting of Mark Items 8, PLT1, PLT3 but Mark Item PLT4 has been removed and a new Mark Item PLT14 added. Note: PLT4 is displayed under the Removed Mark Items smart filter and the Can Revise checkbox is un-ticked which means that PLT4 will be placed on hold. PLT14 is a new item; therefore this is a Mark Item Created. The Can Revise checkbox is ticked which means that the revision will take place automatically. 6. Tick the Place removed items on hold radial button; this will place Mark 8 on hold and only the removed Mark Item PLT4 on hold. These are denoted by the red flag. 7. Click the Finish button, the Contract Detailed Listing form will now display Mark Item PLT4 on hold and the new Mark Item PLT14 added to the Component Mark Items window. Note: If the Hold all mark items on a removed mark checkbox is also ticked then the Mark will be placed on hold along with all of the associated Mark Items. 8. All other Mark Items will remain released, nested and issued to production. Note: In the above snapshot of the Production Nesting Ordering form you can see PLT4 marked as on hold with the red flag and the new PLT14 appears as Not Covered. If the quantity of a Mark has been decreased then StruM.I.S will interrogate the Mark Item Status and detect whether the Mark quantity being reduced is lower than the lotted quantity of the Mark. The following example is based on the Revision Setting for Non-Material Changes set to Allow All Revisions and for Mark Quantity Decrease set to Allow Revision if Released. • Mark B12 – Qty = 3 off, all in Phase 1 Lot 1. 2. Mark B12 has been released but has not been nested or issued to production. • Mark B12 – Qty = 2 off, all in Phase 1 Lot 1. Note: All instances of Mark B12 have been changed; therefore this is a Mark Phase/Zone Quantity Decreased, a Mark Lot/Load Quantity Decreased & a Mark Quantity Decreased. The Can Revise checkbox is ticked which means that the revision will take place automatically. 6. Click the Finish button, the revision will now take place automatically and Mark B12 will be rolled back to Lotted (not released). • Mark B25 – Qty = 3 off, all in Phase 1 Lot 1. 2. Mark B25 has been released, nested and both Mark Item and Mark work orders have been generated. • Mark B25 – Qty = 2 off, all in Phase 1 Lot 1. 6. For the revision to take place Un-nest all instances of Mark B25 (this automatically un-issues the Mark Item Work Orders). 10. Click the Finish button, the revision will now take place and Mark B25 will be rolled back to Lotted (not released). 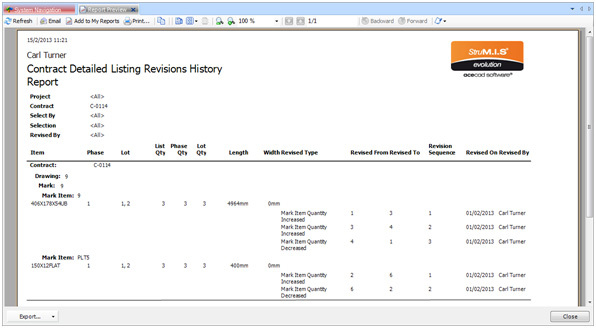 Contract Detailed Listing Revisions History Report – The Contract Detailed Listing Revisions History Report displays a list of all revisions that have been imported for a specific contract. Something that we as a company have in common with Tekla is the many mutual Customers we share. With so many customers using Tekla to detail their steelwork and StruM.I.S evolution to manage their production, it makes perfect sense that there should be a link between the two. That link comes in the form of Producing BIMReview models in Tekla that can in turn be imported into StruM.I.S evolution. The Plugin must be installed on the same computers that have Tekla Structures installed. At the time of writing, it is compatible with Versions 16, 16.1, 17 & 18. Note: If BIMReview has been previously installed, choose the option to Modify. 2) The Custom Setup screen will be displayed. 3) Choose the components you wish to install. 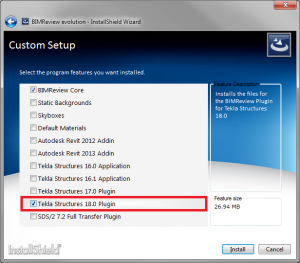 In the example to the right, Tekla Structures version 18.0 Plugin has been selected. 4) Click the Install button to complete the installation. Now that the API Plugin has been installed, it is necessary to add the icons to the workspace within Tekla. 2) Click on Tools then select Customise. 3) Click on the New button – This has created a UserToolbar1 in the example below. 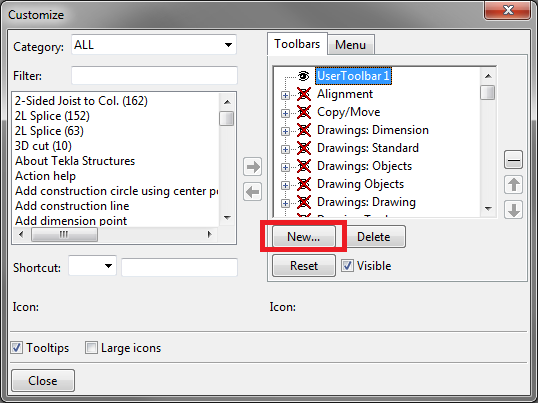 4) With UserToolbar1 highlighted, type ‘BIM’ into the filter field. This will allow us to find both the Export and Import icons. 5) Add both to the UserToolbar1 by clicking the right arrow as highlighted below. 6) The Icons will now be added to the Tekla toolbar and look like the image below. 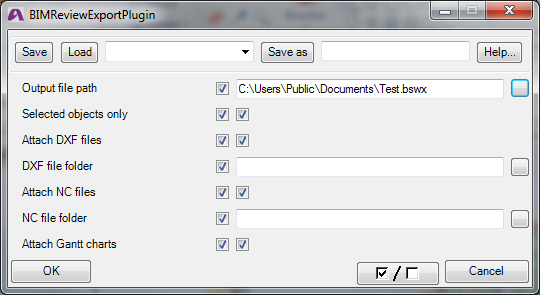 Now that we’ve installed the BIMReview plugin and added the shortcut icons, we are able to export a BIMReview model. 1) Select the entities you wish to export to BIMReview. I’ve highlighted all items in the simple model below. 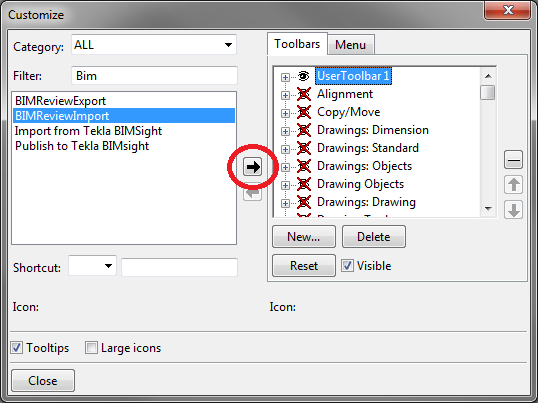 2) Click on the BIMReview export icon as shown in the image above. 3) This will open a box as shown below. You must specify a path to export the file too. Other boxes are optional. 4) You may or may not be prompted to Re-mark the model at this point depending on how up to date the marking is for this model. 5) You will receive a message to say that the export is successful, click OK.